The Scotty Monteiro Jr. Foundation will enrich our youth with positive possibilities. We believe that the community as a whole must adopt an active role in providing for the welfare of its children in efforts to secure a brighter, peaceful, future for all residents. 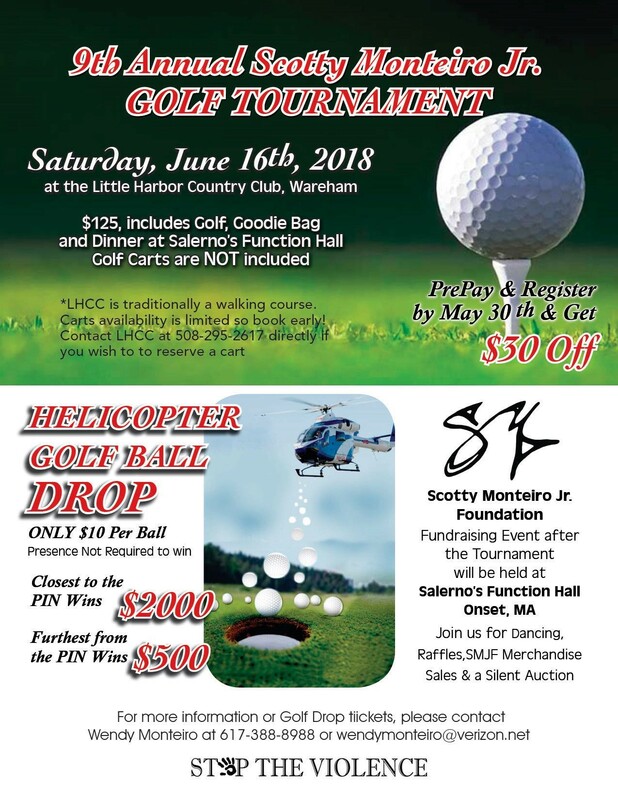 Join us for the 9th Annual Scotty Monteiro Jr. Foundation Golf Tournament held at the Little Harbor Country Club in Wareham, Ma on Saturday, June 16. Support a great cause and enjoy golf, prizes, dancing and dinner. Scotty was senselessly murdered on September 5, 2009. Scotty, always the peace keeper, innocently tried to stop a kid from being robbed. He was fatally shot in the head. His death has affected so many in our community. Scotty was a great kid, well liked and loved. The Scotty Monteiro Jr. Foundation has been established to STOP THE VIOLENCE. All Proceeds help the Scotty Foundation bring STOP THE VIOLENCE education programs and awareness to your community and support our youth. We would like to remind you that in addition to attending the events, you can also donate any time simply by clicking on the “Donate” button at the bottom of our main page. The Scotty Monteiro Jr. Foundation. All rights reserved.